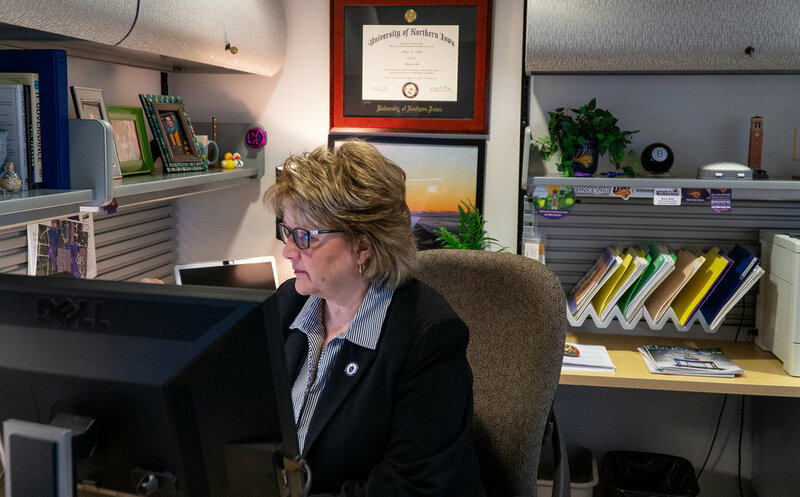 Marty is the CIO at UNI in Cedar Falls, where she provides leadership for university-wide IT services, strategic planning, governance and policy, compliance, and resource management. An alumnus of the university, she is passionate about helping UNI continually evolve its systems, technologies, and services to best serve its students, as well as mentor members of the IT team. Marty represents the university in a variety of state, regional, and national organizations including the Iowa Board of Regents CIO Council, the Midwest Higher Education Compact, and Educause. I began my career in technology as a software developer for the student information system used by Iowa’s Area Education Agencies. From there, I moved to the private sector working as a software developer and systems administrator for a company that provides services to the medical community. While there, the client-server model of computing became the standard, and I was responsible for introducing and supporting networked systems for the clients the company served. This led to my first position at the University of Northern Iowa, in 1989, as a network and systems administrator, and eventually Director of Technology Services for the Division of Administration and Financial Services in 1998. Our team was responsible for a wide range of specialized systems, technologies, and services in support of Intercollegiate Athletics, the Gallagher-Bluedorn Performing Arts Center, University Police, Human Resource Services, Financial Services, Facilities Management & Power Plant, Environmental Health & Safety, Office of Sustainability, and UNItix (central ticket sales). While in this role, I had the opportunity to serve as project manager for a multi-year implementation of the university’s core finance and human resources system. I also enrolled in graduate school and earned a master’s in instructional technology. That brings me to today, where I’m entering my fifth year as UNI’s chief information officer. Tell us about your role as chief information officer at UNI. The primary role of the CIO in higher education is to align IT to the vision and goals of the university as a whole. This requires an awareness of the complete institution and is accomplished by participating in strategic discussions and forming trusted relationships with leaders and stakeholders across the institution. I work to ensure that visionary, effective, and efficient technologies are in place to support the academic programs of the institution and communicate the value of those services. Data analytics has become fundamental to informed decision-making and strategic planning, making IT an essential partner. Information technology can now be found in literally every area of the institution, and so, in addition to the broader goals of the university, information technology also serves the unique needs of units within and external to the university. I often think of UNI as a small city, providing a wide range of services — education, business services, residential, dining, fine arts, athletics, and many more. 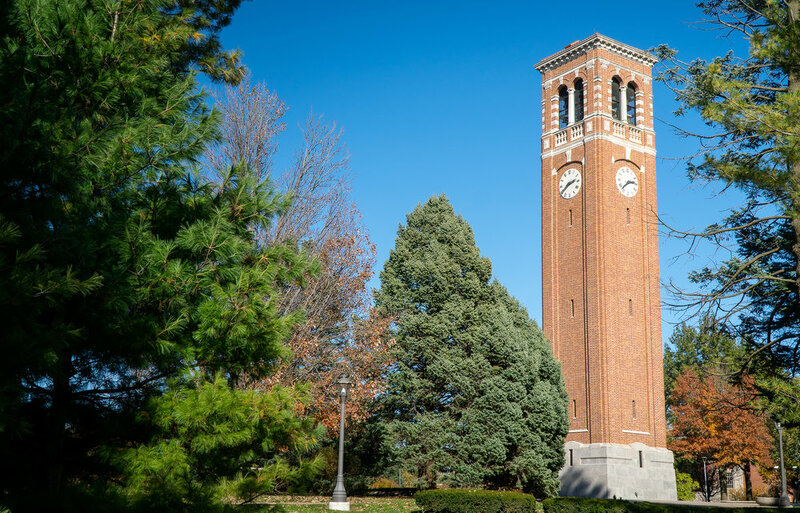 As you might expect, the technologies required to support these unique areas are very diverse, and as a result it is important to work closely with each area of campus to understand their needs and design IT solutions that are essential to their operations. One of the most rewarding aspects of being the CIO at UNI is the opportunity to work with an exceptional team of IT professionals who are talented, innovative, and committed to the university. We are responsible for providing a fully array of services and are organized into units, each led by a member of our outstanding IT Leadership Team. The style that appeals to me, and perhaps comes most naturally, is service leadership. I aspire to be a collaborative leader that fosters teamwork and an environment where we work together to cast a vision, focus on long-term success over short-term wins, and celebrate team success. As a department, we are focused on what is best for the university and recognize that our success is often reflected in the success of those we serve. Effective leadership empowers others, and I thoroughly enjoy seeing members of our IT team succeed and grow in their areas of expertise, as well as in their careers. Without a doubt, education is absolutely essential. Embracing lifelong learning is a must in any career, but it’s particularly true in the constantly changing field of IT. I’m confident that I would not be in my current role without the knowledge and critical thinking skills that are developed through formal education. Experiential learning has also been valuable, providing opportunities to learn and develop specific skills by doing. I recently spoke with one of UNI’s career counselors about this very subject, and he compared career progression to walking up a down escalator. You need to keep learning and growing to continue moving up the escalator. If you stop learning, you will pause for a brief period of time and then begin to fall back. I think this is a very good analogy for the importance of lifelong learning. Was there an “aha” moment as a child where you knew tech was what you wanted to do with your career? Growing up, I planned to pursue a career in instrumental music.It wasn’t until I was in college that I began to think about technology as a career. Reflecting back, I think it all began when I first came into contact with one of the original personal computers. Learning to code was so much fun, and I developed an intense curiosity about technology. I knew right away that I wanted to learn all that I could about every aspect of technology. Yes, absolutely. I’m so grateful to have learned from and been inspired by numerous individuals along the way. As I look back, I’ve been fortunate to have both formal and informal mentors from a broad range of areas of expertise and perspectives, including IT professionals, administrators, faculty, staff, students, and, most importantly, my family. I currently have several role models among UNI’s Senior Leadership Team who have been so supportive of the IT department and have taught me a great deal about effective leadership. One of the most interesting and invigorating things about being CIO is that there are no typical days. At a high level, my calendar includes meetings that focus on strategic planning with university, academic, IT, and student leaders; designing technical solutions to meet needs; compliance; security; project management; resource management; and issue resolution. The specific topics and technologies discussed each day are widespread and require a nimble approach. Recently, over the course of a single day, I participated in discussions about predictive analytics, data governance, point of sale systems, an athletics instant replay system, the CRM project plan and timeline, the future of student computing centers, the UNI mobile application, IoT devices, eLearning system integration, and guest Wi-Fi services. The variety of strategic discussions and challenges I encounter is energizing, and at the end of the day I feel a sense of accomplishment for having participated in moving the university forward. The data is out there that younger generations aren’t staying in their jobs for 20 or 30 years; it’s more like 2 or 3. What’s it like to work at UNI for almost 30 years,and what has kept you there? The University of Northern Iowa is a special place. It’s an honor for me to be part of an institution of higher learning and a member of a community that’s completely committed to our students and their success. A community that cares about each student as an individual, getting to know them when they arrive as new students, helping them prepare for their professional lives, and cheering for them when they walk across the stage at commencement. I thoroughly enjoy the energy our students bring to campus, and it’s particularly rewarding to see our IT student employees receive job offers as a result of the experience gained working in our department. UNI is a place where important things are happening and a place where you can make a difference.The technologies that our IT professionals design, implement, and support are cutting edge and forward thinking. Because technology touches literally every area of the campus, IT is involved in supporting a variety of unique technologies, while also learning about the educational, business, or operational needs of the area we are working with. UNI offers opportunities to learn, to get involved, and to progress through your career path. Rather than having to change employers to advance, UNI allowed me to advance in knowledge and from a career standpoint without leaving. I’ve been able to serve on a variety of councils and committees, focused on a multitude of topics and disciplines. In sum, I get to see every aspect of university life, which is diverse and exciting. There are so many things that I love about UNI. The people. The beautiful campus. The view of the Campanile and the UNI-Dome from the glass elevator in my building. The concerts, athletic events, and productions. Working the UNI booth at the Iowa State Fair. UNI is also my family’s university. Seven members of my family have graduated from UNI. It’s special to be in an environment where everyone takes pride in the work that they do and in being a Panther. Can you tell us about an exciting project or initiative you’re working on right now? As you might imagine, we have multiple projects underway and many more in the queue. One of our larger initiatives involves the entire campus community and is transforming how we communicate with and serve our constituents. To put the project in context, higher education institutions have experienced a significant shift in the way students prefer to maintain relationships with their universities, seeking more personalized, proactive, and timely interactions using primarily digital communications. In response, a major initiative is underway to implement a constituent relationship management (CRM) system, which is enhancing the way that the university engages with prospective and current students, alumni, and patrons. The system is also improving the coordination of services provided across the campus in support of student success. How will new technology innovations make for a better learning experience for UNI students? In consultation with UNI faculty, we’re continuing to enhance and add to our suite of technologies that support learning and teaching methods. The suite currently includes our primary learning management system, lecture/capture system, polling system, video conferencing, computer-based testing, and assistive technology, to name a few. To improve the IT experience in the classroom, a standard suite of technologies is being installed in general use classrooms, providing a consistent experience for instructors and students as they move from location to location. The technology that has been most widely touted allows multiple participants to wirelessly connect their laptops and mobile devices to an in-room display. Of course, Wi-Fi is available all across the campus. Technologies are also being implemented that will allow students to use discipline-specific software from mobile devices without needing to visit a lab on campus. An initiative with the library is underway to offer virtual reality technologies and support services as a component of specific academic programs. There has been quite a bit of interest expressed, and content is being developed that immerses students in an experience that supports the discipline they are studying. Looking ahead, we’re closely following the next generation of digital learning environments and are building a framework to support the core concepts of personalized learning, system interoperability, analytics, advising, learning assessment, and Universal Design for Learning (UDL). UNI will soon be adding to this ecosystem in the area of learning analytics. You’re involved in a number of leadership groups and councils. Why is leadership outside of your functional role important to you? Being a member of a variety of leadership teams on campus offers new insights and a broader sense of purpose to our IT organization and to me in my role as CIO. Involvement in these groups provides a deeper understanding of the priorities of the university as well as a valuable avenue to network, collaborate, and strategize on how best to achieve our goals. Sometimes I’ll volunteer to serve simply because it’s something that I feel is important or it’s an area of personal interest. The same is true for participation in professional organizations external to the university. Organizations like TAI, the Midwest Higher Education Compact, and Educause are important avenues for collaborating with a network of peers and where I gain insight into what technologies are in use at other institutions. This helps to shape future directions for technology at UNI. When I was named CIO, the Regents institutions were in the process of completing a comprehensive efficiency study that included a review of the IT organization and the services we provide. At UNI, one of the findings of the study pointed to the need to transition from a decentralized support model to a model that centralized all IT systems, services, and employees. As you might expect, a shift of this nature produced anxiety in areas of campus concerned with experiencing a potential decrease in service and a shift in practices, as well as policies. To address and alleviate these concerns, individuals from all across the campus community, including every IT professional, were involved in establishing the vision for our future organization, including how the department would be organizationally structured. We compiled a complete inventory of systems supported and services provided, identifying redundancies and collectively deciding on a single method moving forward. While in the process of addressing these major changes, I met individually with every IT professional to learn more about their individual professional goals and their ideas for improving IT at UNI. This inclusive and measured approach to implementing the recommendations of the study resulted in the successful consolidation of 16 distinct IT departments, the retirement of 26 applications (5 of which managed work tickets), updated IT job descriptions and established career paths, the implementation of new and agreed upon standards throughout the department, and a 6 percent decrease in the IT budget with an increase in client satisfaction. These successes are the direct result of the university coming together and establishing a collective vision for IT. I credit and thank the IT Leadership Team with continuing to identify opportunities for improvement and continuing to build on the progress made. How has your work evolved as technology has changed over the past three decades? When I began my career in technology, systems were fairly stand-alone and single purpose. They were primarily focused on core business functions, and the technology used in support of learning was not very adaptable. Connectivity and access was wired-only and limited to specific locations. Needless to say, things have certainly changed since then. Every year Educause, an organization that is focused on advancing higher education through technology, publishes a list of top IT issues and trends. Their list does an outstanding job of explaining how technology continues to evolve and points out that institutions are addressing many of the same challenges. In 2018, the top issues and trends included many items that UNI is currently focused on, particularly in the areas of business intelligence and analytics, security, systems interoperability, mobility, and initiatives in support of student success. Underlying these challenges is an increasingly complex data network and systems architecture. What advice would you give a young woman who aspires to have a technology leadership role? What I wish I had known earlier is that there are many paths to leadership roles and there are many effective leadership styles. What works for one person may not work as well for another. The key is to be yourself, get to know your strengths, and lead from there. There are also some concrete skills that can help you prepare for these roles. Of course, the most obvious one is gaining an in-depth understanding of the technologies you are specializing in and the industry you are working in. In addition, understanding project management methodologies and developing the ability to interpret data to inform strategic direction. Listening and communication skills are essential. Strive to be the person who can not only listen to a high-level concept and convert it into a technical solution but also communicate those highly technical concepts in a clear manner to professionals working in areas outside IT. Finally, find mentors and role models to help you along the way. What do you foresee as the biggest challenges ahead in preparing students for the technology industry? I think that one of the biggest challenges in preparing students for the workforce is that while we are developing skills that are necessary and relevant today, we also need to prepare students for jobs and technologies that do not yet exist. Students will need to adapt to rapid change and develop the ability to independently research and learn. I’ve also come to think of IT as a “team sport” where collaboration skills are fundamental. What do you envision or hope for the future of tech in the great state of Iowa? Iowa has a long and recognized tradition of providing leadership in education and pioneering advanced teaching methods to improve learning outcomes. Iowa is also a proven leader in technology, with a long history of tech inventions and cities receiving national attention such as “up-and-coming tech hotspots” and “best cities to work in tech.” Combining these traditions of educational and technical excellence with Iowa’s focus on STEM and entrepreneurial ventures to develop products in support of the next generation of digital learning environments would be a powerful combination for the state of Iowa. Producing products in support of personalized learning experiences will be essential for the new learning ecosystems being developed. Iowa could be a leader and important contributor in this evolving space. If you weren’t in your current role, or if you could go back and do something differently, what would you do? I thoroughly enjoy and am grateful for a career in technology, and given the opportunity I don’t think that I’d change anything. That said, if a career in technology was not an option and skills were not a barrier, I would choose to be a professional musician playing for a major symphony orchestra. I studied clarinet as an undergraduate and was with the Waterloo–Cedar Falls Symphony Orchestra for many years. First and foremost, I enjoy spending time with my family. I enjoy going to athletic events and concerts, particularly if family members are participating. At home, I spend time learning about new technologies and watching way too many music videos on YouTube. I’ve not had time recently for it, but I enjoy golf outings, although these days it’s got to be a best shot tournament. If you were to take a look at my personal devices, you’d see a wide range of musical styles, from classical to jazz to pop and a little bit of country. My go-to music, however, is R&B, and my most recent downloads are Bruno Mars and Drake. Do you have a favorite snack or dish you like to make at home? My favorite snack is popcorn, and I think that my colleagues at work would tell you that I always seem to have a Diet Pepsi close by. Do you have any favorite TV shows or movies? What kind of legacy do you want to leave at UNI? The legacy that a mentor left to me and one that I hope to leave as well is the importance of service to others in all that we do, which includes building community, giving back, and empowering others to achieve their potential.